Any corrections or comments are welcome. Developments, updates to The Cleveland Neighborhood Map are on hiatus. As my first map and the catalyst for my passion in maps and geospatial, Cleveland’s neighborhood boundaries still interest me but I’m devoting my time to other projects. – the neighborhood names are semi-translucent, to allow you to see the streets and other features underneath the neighborhood names. – There are several neighborhoods [Central] that I have not yet added on there. – Convert the scale from metric to imperial. residents, business owners, and stakeholders of Cleveland that I’ve informally talked to. This map is under a Creative Commons CC-BY-SA License [2.0]. – Map colors and their advice from www.ColorBrewer2.org, by Cynthia A. Brewer, Penn State. Fonts used: Liberation Sans Bold (for the neighborhood names) and Verdana for the name and details box. Moving back to Cleveland in 2009 after being away for 4 years, I heard about other neighborhoods in Cleveland (like Larchmere and Central) in the news or in conversation and wondered: where are they exactly ?! I wanted to hang a map of Cleveland on one of my bedroom’s walls and couldn’t find one that would suit my needs with demarcated neighborhoods, a selection of colors that I liked, in a larger size that would be suitable for printing and displaying; something similar to this map [Large PDF] from New York City’s Planning Commission. With some time on hand, I’m creating one. Google maps has some neighborhoods listed on its maps they don’t show the neighborhood or city boundaries; plus their fonts are slightly tiny. Other web-map services like Yahoo and Bing import their neighborhood boundaries from the city of Cleveland’s SPA (statistical Planning Areas) which, frankly, are outdated. Nonetheless, Neighborhood boundaries are fluid, subjective and they change over time. 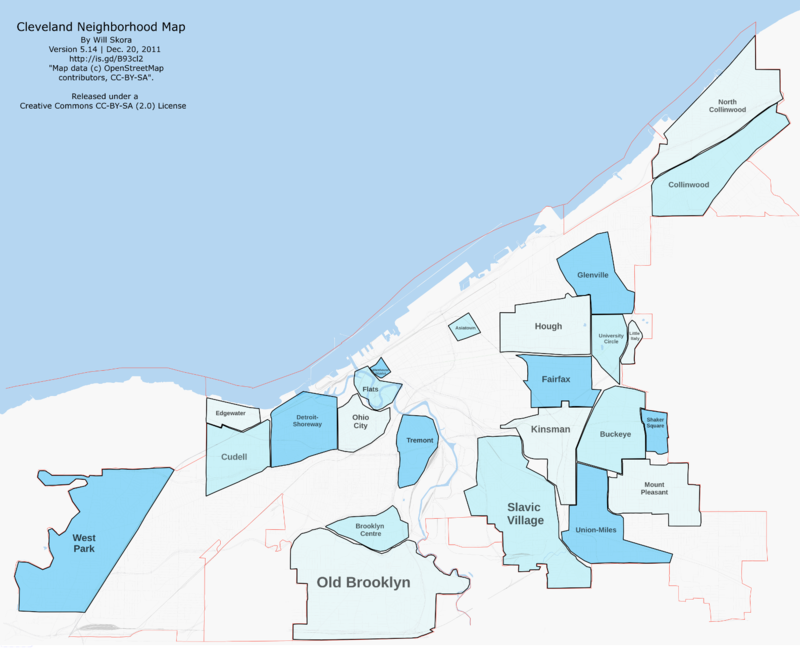 I hope for the Cleveland Neighborhood Map to be a springboard for people to learn about their city, its neighborhoods, spark discussion of neighborhoods in Cleveland.